Recent production three rail trains. Ace brand Metropolitan electric locomotive and a Schools class in different livery. Also an Ace canopy station, plus some old time trains 0n shelf above. 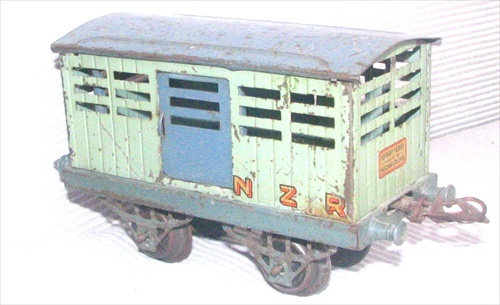 Hornby lettered certain prewar items NZR for export to New Zealand. This an example of an older style chassis being used for export. The couplings are a later style than the chassis. Permanent layouts are nice, but most toy trains were played with on the floor, with the railtracks being set out for a few hours. Even a layout such as this is more than most young boys achieved. Sharply curved rails did not take up much space on the lounge floor. These are 3 rail tracks for electrically powered locomotives (as common in the USA) but clockwork engines will run on it too. Hornby in trouble! The first type of 20volt motor powered Hornby (using the French Hornby style motor) has a problem! The Hornby crane is inadequate to lift the loco so a bigger Lionel crane is assisting. Not sure how an American crane got to be in New Zealand (note the NZR lettering) - perhaps during the war some USA equipment was sent to help. 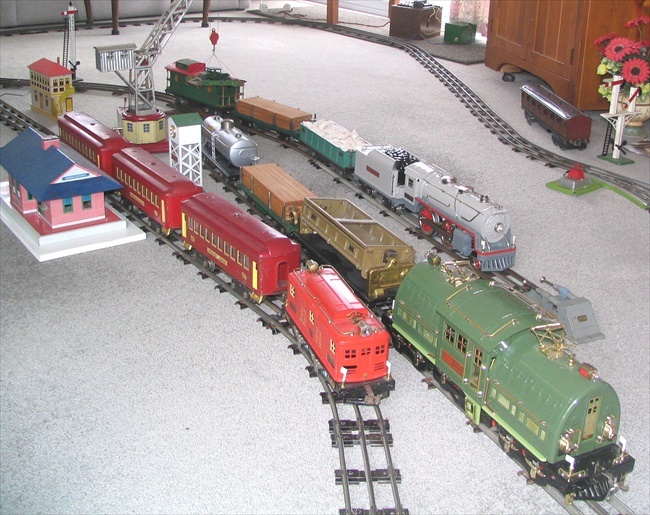 This illustrates how toy trains varied considerably in size! They are same gauge which means they run on the same track spacing. This is Gauge 0 which is one and a quarter inches between rails. These are not scale models! Left is a Brimtoy. At right is a Bowman. The Brimtoy has a small clockwork motor which gives a running range of about 24 feet. The Bowman is a methylated burning live steam locomotive and runs for over half an hour on its water and fuel supply. 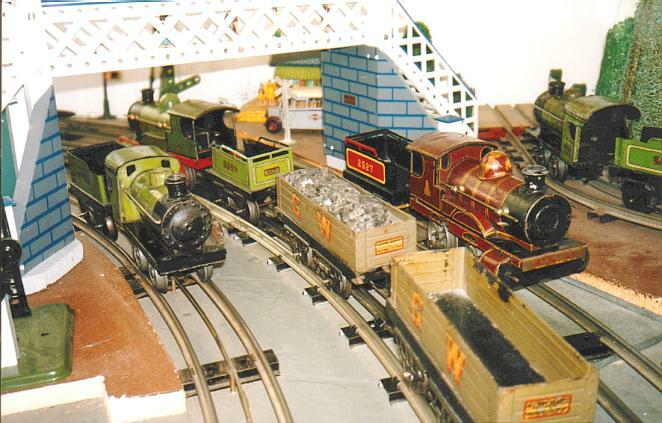 Hornby trains of the 1920s. Cheaper range items. The locomotives were heavily influenced by the German Bing types which dated back to even earlier times. They were so similar to Bing models that some enthusiasts claim that Bing made them for Hornby, but that does not seem to be the case! Links to other pages of this site are at top left. Live steam 0 gauge locomotives in action. NZ made Cranko & Auld, plus Bowman and Bing. Dutch Hornby Railway Collectors Assn. Binns Road - Photos of many types of toy trains, etc. Youtube showing 0 gauge airscrew propelled `Zeppelin` railcar. Glenn Ball`s illustrations including toy trains. Te Awamutu Train Show April 27th-28th. Te Awamutu Events Centre. Includes 0 gauge layout. Bring trains to run. Christchurch Area. Meeting expected in a few week`s time, advice to come.